Not surprisingly, interacting galaxies have a dramatic effect on each other. 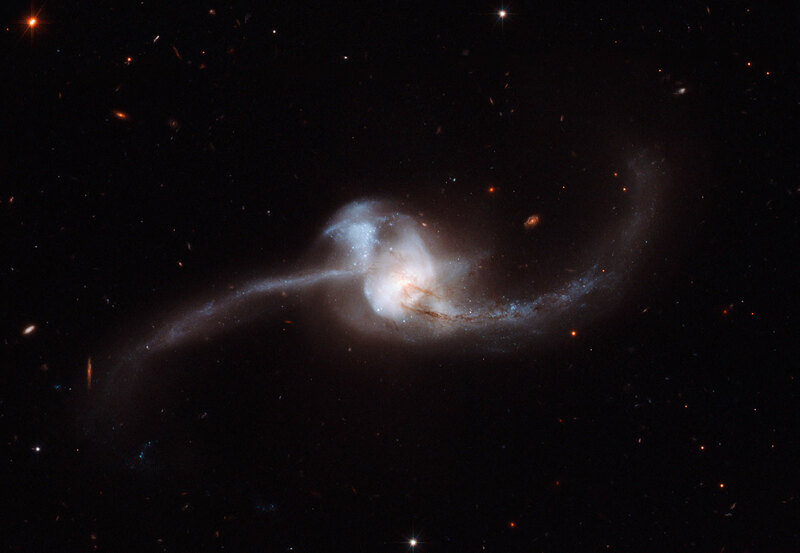 Studies have revealed that as galaxies approach one another massive amounts of gas are pulled from each galaxy towards the centre of the other, until ultimately, the two merge into one massive galaxy. NGC 2623 is in the late stages of the merging process, with the centres of the original galaxy pair now merged into one nucleus, but stretching out from the centre are two tidal tails of young stars, a strong indicator that a merger has taken place. During such a collision, the dramatic exchange of mass and gases initiates star formation, seen here in both the tails. The prominent lower tail is richly populated with bright star clusters — 100 of them have been found in these observations. These star clusters may have formed as part of a loop of stretched material associated with the northern tail, or they may have formed from debris falling back onto the nucleus. In addition to this active star-forming region, both galactic arms harbour very young stars in the early stages of their evolutionary journey. Position (Dec): 25° 45' 15.25"